Maximum Velocity Track and Field Academy: World Record Holder, Kevin Young, To Work With Hurdlers! World Record Holder, Kevin Young, To Work With Hurdlers! Camp Director, Lisa Owens, is happy to announce that Kevin Young will be a clinician at the 2012 Academy. 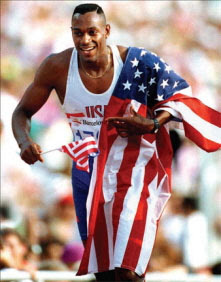 Kevin is a 2-time Olympian, placing 4th in 1988 and 1st in 1992 in the 400m hurdles. Kevin set the world record during the finals at the 1992 Olympic Games in Barcelona running 46.78 seconds. The record still stands today, and Kevin remains the only person to run sub 47 seconds in the event. Click on the video to watch Kevin's world record performance. Kevin is replacing Bershawn Jackson who is now unable to attend due to a scheduling conflict.